Every organization undergoes change as people move on in their careers or life in general. We see it all the time on the Department, in local and national politics and in the growth and evolution of private corporations. While it can occasionally be somewhat “unsettling” since most of us are more comfortable with what we are used to, the fact is that change tends to stimulate individuals to enter into new areas, infuse new ideas into an organization and makes us take stock of where we are and, more importantly, where we are going. With that said, I would like to tell you of some changes that are occurring within the Historical Society. A lot of you probably already know that Richard Kalk, the acknowledged founder of LAPM, is no longer at the Museum full time as a staff member. Can’t say as I blame him for wanting to have more time to enjoy his retirement but we hope that somewhere down the line he will continue to be a resource for the museum with his vast store of Dept. history. well qualified replacement for Dave has recently been hired as the new Executive Director. Retired Sergeant Glynn Martin, who enjoyed many assignments before retiring from Northeast Area a few years ago is already working with Dave for a smooth transition on the first of February. I know the society will benefit greatly from Glynn’s varied background and organizational skills. sense of direction to the Society. Many of you know Bill whose last assignment prior to his retirement was as the OIC of North Hollywood Vice. So, there you have it. A few of the recent or upcoming changes which will affect the Historical Society. Before I conclude this article I would like to tell you of the project that I mentioned earlier. The Historical Society has entered into an agreement with the Arcadia Publishing Company to produce a photographic history of the Dept. under their umbrella series called “Images of America” The Images series consists of over 2000 books documenting the photographic histories of cities, amusement parks, large companies etc. I will be working with fellow board members Art Sjoquist and John Thomas in researching the photo graphic archives of not only the Historical Society but other local resources to tell the story of our department in photos. We are very excited about this challenge and it occurs to me that many of you might have some personal work related photographs that illustrate significant incidents or activities that took place during your career. I would ask you to look through your personal memorabilia and determine if you have any good quality photos that you think illustrate an interesting aspect of police work. We can’t promise to use every one submitted but, if we do, we would provide appropriate credit. If you come across one, you can make a copy and send it along with a brief narrative as to what it depicts including names and dates and send it to us in care of the Museum at 6045 York Blvd. 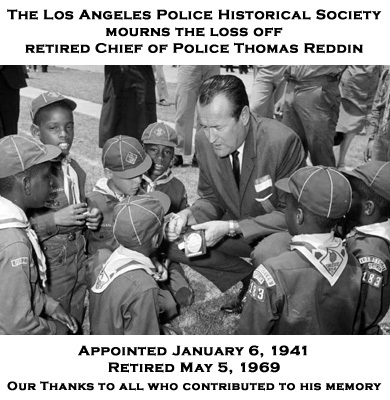 As I have said before the history of this department has been created by the day by day, year by year actions of thousands of individuals like you and me who chose to make the LAPD their career. We’re going to try to tell that story in pictures. You put your whole self in, You take your whole self out, You put your whole self in, And you shake it all about. You do the Hokey Pokey, And you turn yourself around; That’s what it’s all about! I’m certain that doing the Hokey Pokey is not what it’s ALL about, but nevertheless, I can’t help but smile whenever this childhood song/dance comes to mind. For the past three years as Executive Director, I’ve had to put my whole self into every aspect of developing “Behind The Badge: The LAPD Experience,” Museum and Community Education Center. My greatest joy has been to see the combined efforts of so many wonderful people come to fruition as our Museum has taken shape. Along the way we have not only “Hokey Pokied” but “twisted and shouted,” “jerked,” two-stepped,” “tango’d,” “waltzed” around a few obstacles, and frequently found ourselves in “limbo.” But all the while we “rocked!” A few headaches, heartaches, laughs, tears, and many smiles later we have much to reflect back upon with great pride and a clear sense of accomplishment. You may have noticed that I am writing this in the past perfect tense, that is—while numerous things have been achieved, many more challenges remain, and the efforts need to continue undaunted. My role in all this will simply change. Effective January 31st, I stepped down as Executive Director. Our Board of Directors has graciously voted to allow me to remain directly involved as a Board member; I am very grateful, because this project and all those involved are very important to me. I am equally proud to announce the appointment of my successor, retired LAPD Sergeant II Glynn Martin. Glynn is exceptionally well qualified for this position, and he has already demonstrated the clear vision, sincere commitment and ability to lead us forward. Please introduce yourselves to Glynn and offer your continued support as he takes on this enormous challenge. I know that he will deeply appreciate your assistance and personal encouragement. My decision to leave was difficult, but I know that the timing was right to draft the next chapter in my life. For over 30 years I have operated a high-end security business part-time, always putting everything else first. But as life circumstances have changed, and the planets have now aligned properly (just kidding), my desire to take this business in a new, exciting direction has intensified. However, it will require my full attention and commitment to succeed. I’m not averse to working hard; it’s just that for once I want to do it for myself. Besides, I offer exceptional services in a high-demand industry where excellence and integrity are paramount. I cannot compromise on the commitment I have made to my clients, present and future. So, as I move ahead, Thank You for allowing me the awesome privilege to have served as your Executive Director for the past three years; I tried my best to serve you well. One lesson that silly nursery rhyme taught me well is that sometimes you have to put your whole self in, and sometimes you have to take your whole self out; and it doesn’t hurt to do the Hokey Pokey along the way—just for fun! • Donate your time as a volunteer. Even a few hours a week can make a huge difference. • Maintain your membership; it’s our life-blood. Consider increasing your annual donation. • Help plan and execute any of several events LAPM sponsors. Your involvement is vital! • Purchase a brick to be placed at either the Wall of Remembrance at the Museum or in the Walk of Remembrance at the old Police Academy. Commemorate someone’s life, career or supreme sacrifice. • Help find, build or donate display cases of high quality for Museum displays. • Support the Museum Store when it’s time to give gifts for special occasions or holidays. • Consider LAPM in your Will or Trust; leave an enduring gift for future generations. • Become a volunteer speaker at LAPD and/or community events to promote our facility and programs. • Everyone can do something! You can make a significant difference. You’ll hear much in the coming months from Glynn and from our newly elected Board Chair, Bill Rinehart, about forthcoming events, challenges and wonderful opportunities as we continue to grow and develop into a world-class Museum. LAPD is the best law enforcement agency in the world! Why? Because of its members! It has always been so. The LAPD Museum—your Museum—is the place to honor the service, dedication, loyalty and excellence that are LAPD! Let’s all make it the best it can be. You and they deserve it! As she nears her thirtieth year of service with the Department, Angie Roman recently reflected on a memory filled career that includes a number of community oriented assignments and notable volunteer efforts. Angie currently serves as thE secretary to Deputy Chief Michel Moore of Operation West Bureau. Away from the office, Angie passionately pursues a number of Department related volunteer activities. 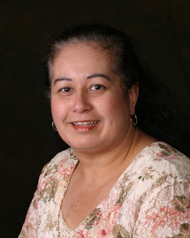 For years, Angie served as the secretary to the Centurions football team. While handling the administrative operations of the team, Angie became acquainted with the Blind Children’s Center. Over the years, the Centurions were able to raise and donate thousands of dollars to the Blind Children’s Center. After a bout with her own temporary blindness, Angie devoted herself to volunteering with the Blind Children’s Center. It seems that volunteerism has become a central theme of Angie’s life. Angie also lends her off-duty hours to the Police Memorial Foundation. And about three years ago, Angie “Just showed up one day” at the Police Museum. With many projects already underway at the museum, Angie’s time was dedicated to organizing and digitizing The Beat magazine. Since the museum’s collection dates to 1948, this undertaking was significant. The acquisition, organization and preservation of the magazines required countless hours of labor. All were donated by Angie. As a result, digital copies of the magazines will soon be accessible at the museum. Angie confesses, though, that her pet museum project entails researching officers killed in the line of duty. It is her personal goal to create a database chronicling the loss as an honor to our “Fallen heroes.” This project illustrates Angie’s devotion to the members of the Los Angeles Police Department. Simpler approaches to retrieving information on slain officers undoubtedly exist. A less complicated approach would not be representative of Angie’s commitment. Every Saturday for the past three years, Angie has gone to the main branch of the Los Angeles Library in order to cull through volumes of newspapers from various areas of the City. researched the line of-duty deaths of about one-hundred police officers. Once Angie completes her labor of love, the fallen heroes database will be available at the museum. Clearly Angie views this project as a labor of love. Angie’s contributions to the museum have already brought her praise from the museum staff. In 2004, Angie was formally recognized at the Chief’s Circle dinner. Angie herself, however is looking forward to two very important awards in the near future. This July Angie will celebrate thirty years of service to the Department. Angie is looking forward to receiving her pin with great anticipation. Along with her pin, Angie is but a few classes away from receiving her bachelor’s degree from Cal State LA. The coming months hold much promise for this dedicated and enthusiastic volunteer. The 1984 Olympic Games turned the eyes of the world toward Los Angeles. The Olympics also brought the President of the United States to Los Angeles a number of times. Not just because he was a Californian, but because of his ties to our City. On each of those occasions, the Department provided for his security. Elements of Metropolitan Division and Traffic Coordination section were responsible for securing various components of the Presidential entourage. So when the Ronald Reagan Presidential Library and Museum decided to include a Presidential motorcade in the Air Force One exhibit, the Department was a natural selection. Later this year the exhibit will open to the public. We were lucky enough to visit this work in progress recently. in a Presidential museum. Uniforms provided by the LAPM will clothe the mannequins needed to bring the exhibit to life. It is with great pride that the LAPM participates in the Reagan Library exhibit. Upon its completion, our vehicles, uniforms and history will be on display for the eyes of the world to witness once again.